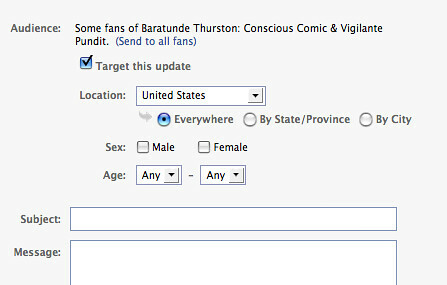 Facebook Pages Finally Let You Target Your Update Messages! Check that out. One thing that made me angry is Facebook constantly saying they care about spam and are nervous about it and trying to stop it (to the point of censoring users), yet forcing Page owners to address every single fan with a message that should be regionally targeted. I like to send out updates about my shows, but that's usually in just one city (sometimes I teletransport). I've been hacking this targeting ability by using events under my Profile (not Page) to invite people in a city to a gig. Now I can target my messages. This is absolutely wonderful. This gives me more of an incentive to drive people to my Page rather than Profile. I still have a challenge in that area, but we're getting closer.